I have flown a REFLEX Mark 2 wing for over nine years. The complexity, stability and speed of this wing still amazes me. Using the speed bar a lot (since the wing's stability in this particular case increases) caused wear on the speed line. This is mainly caused by the fact that only a single pulley is originally used. 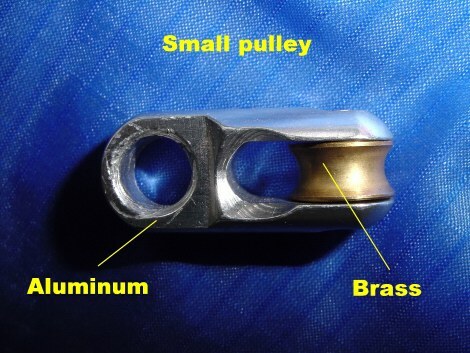 Instead of a second pulley, the manufacturer used a ring. 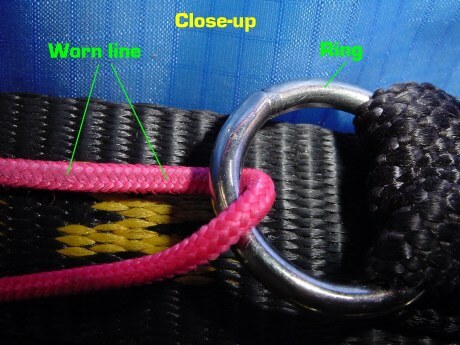 Here is a close-up to illustrate how and where the wear occurred on my line. I decided to remove the existing ring and add a small pulley. 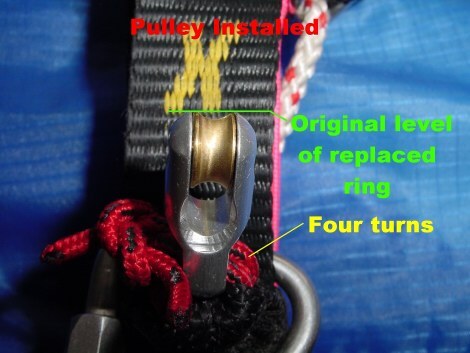 The pulley (illustrated below) is a used one but in perfect condition. 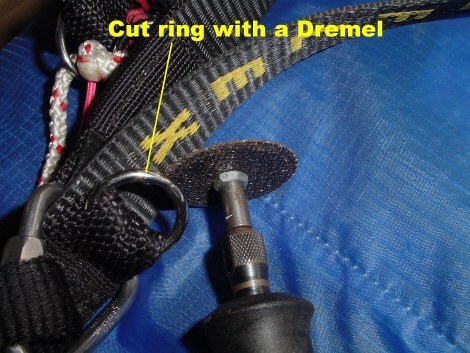 In order to install the new pulley, I removed the ring by cutting it with a DREMEL. 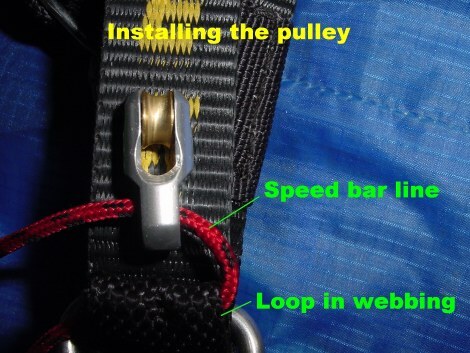 Once the ring removed, I used the same loop in the webbing to install the new small pulley. I used a regular speed bar line to fasten the pulley. At first, I wanted to utilize a small oval shaped carabiner but later, I decided to use the speed line, in order to make the pulley as stable as possible. Both pulleys are aligned to ensure a smooth travel of the line. I made four turns with the line for getting the pulley as close as possible to the same level as the original ring was. Failing to do this, would cause a wrong travel of the speed bar thus giving a different performance and behavior to the wing then designed by the manufacturer. 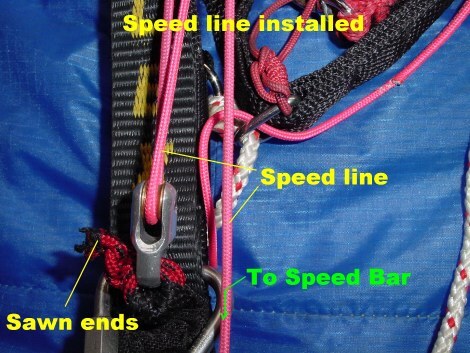 Once the four turns of the line were finished I made two securing knots and I also sewed the ends of the line with polyester thread. Now the travel of the speed line is very smooth and the line will not get further damage caused by the friction on the ring. 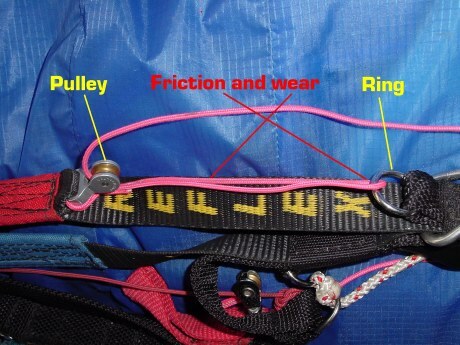 The above method can be used on any other wing that has a ring instead of a pulley. Such a pulley is also recommended to be used on brakes if they are fitted with a ring. Such wing was the APCO Fiesta but there may be probably other wings like this out there flying. With the above modifications, I have flown the Reflex Mark 2 for many hours. The pulleys work very well and the speed bar is much easier to activate.